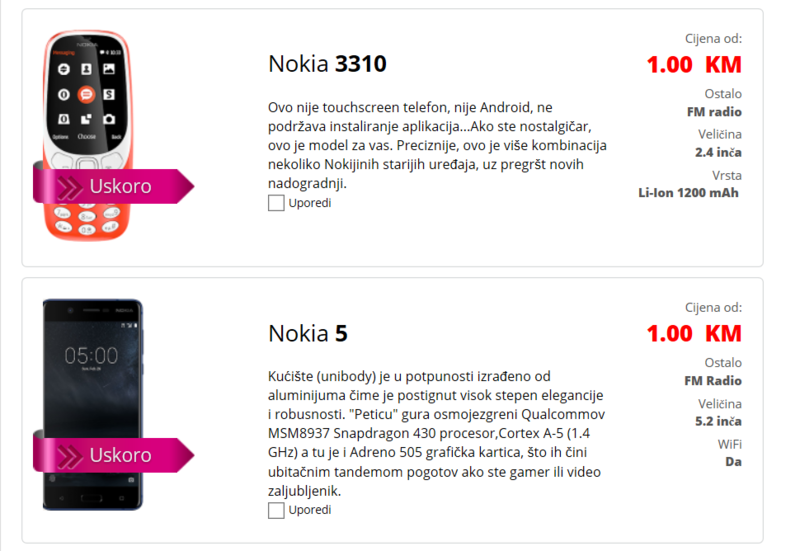 M:tel telecom has put up a product page for the new Nokia 3310 (2017) and the Nokia 5 with the notice “Coming soon”. M:tel operates in Bosnia and Herzegovina, and together with the 3310 and 5, m:tel introduced the Nokia 108, that is available for purchase today. The prices of the 3310 and 5 are unknown, as well as the release date. Technically, m:tel will offer the phones with a two year contract for 1KM (about €0.5 ), but the retail price without the contract is not made public. We can guess that it’s number of weeks before the phones become available, because phone operators don’t put products on their webshop if the phone aren’t coming soon. If you notice your local telecom offering the new Nokia devices, leave a comment below or send us a tip in the “Tip us” section.